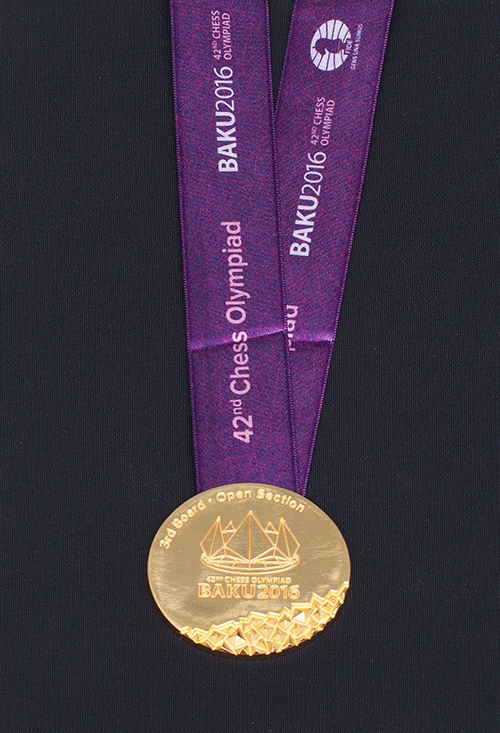 In 2016, for the first time in 40 years, the American national team edged out 180 countries from around the world to win gold at the Chess Olympiad in Baku, Azerbaijan, solidifying America’s status as a powerhouse in the chess world. 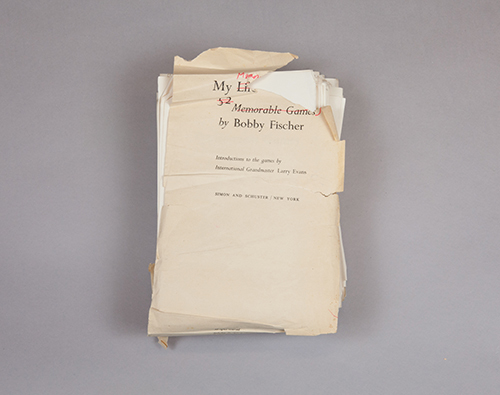 This multimedia exhibit features never before exhibited artifacts and honors the rich legacy—and bright future—of the American Chess Olympiad team. Inspired by the American team’s victory in the 2016 Chess Olympiad, Global Moves: Americans in Chess Olympiads examines the competition through just one of the many lenses we could use to explore its long and storied history—the experiences of American players. 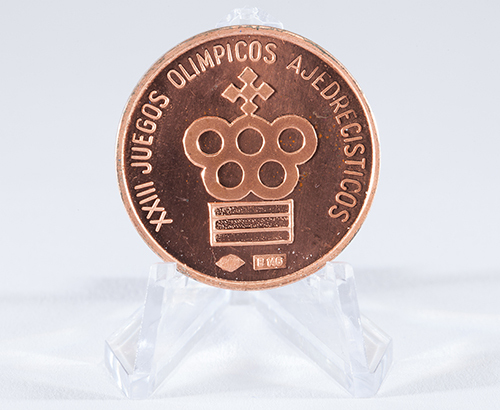 Chess Olympiads are biennial tournaments in which teams of players work together to represent their countries. 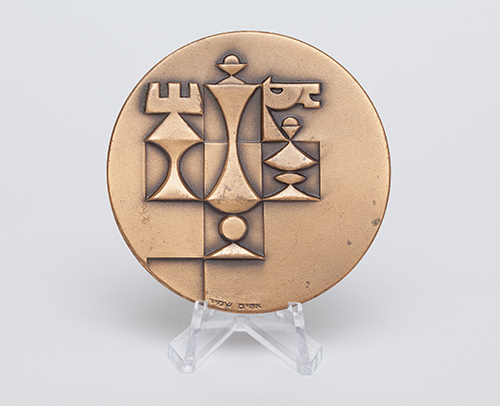 The early years of the tournament marked a golden age of American chess, when teams brought home team gold four times in a row. 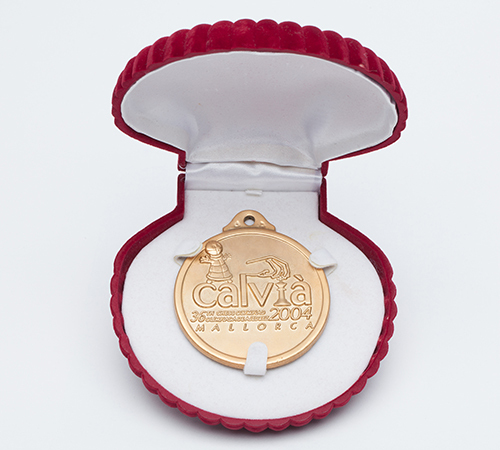 2016 marked the first team gold achieved by the United States in 40 years, and the first time they had won team gold in an Olympiad that included Russia or the Soviet Union. The Kasparov Chess Foundation, Chess Club and Scholastic Center of Saint Louis (CCSCSL), and US Chess offered support to the team, which included Grandmasters (GMs) Fabiano Caruana, Hikaru Nakamura, Wesley So, Sam Shankland, and Ray Robson, with International Master John Donaldson as team captain and GM Aleksandr Lenderman as team coach. Together they made history, bringing the Hamilton-Russell Cup back to the United States for the first time since 1937. This victory was especially meaningful on the Saint Louis Chess Campus, which includes the CCSCSL and the World Chess Hall of Fame (WCHOF). The CCSCSL hosts many elite tournaments, including the U.S., U.S. Women’s, U.S. Junior, and U.S. Girls’ Junior Chess Championships, along with tournaments like the Sinquefield Cup and Saint Louis Rapid & Blitz that bring in the top talent from around the country and the world. This is part of an effort to promote chess in the United States and provide opportunities for the best American players to compete on a global scale. 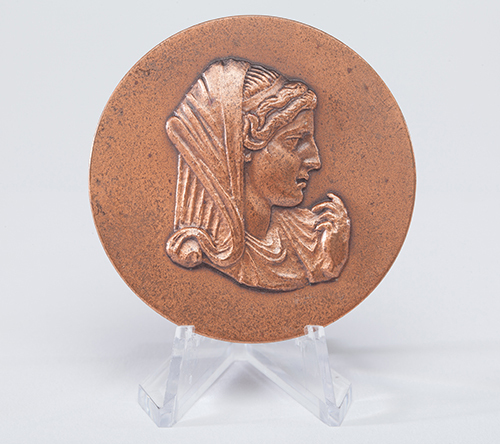 Global Moves features Olympiad artifacts from our own collection as well as materials from over 20 lenders and donors, among them inductees to the U.S. Chess Hall of Fame. 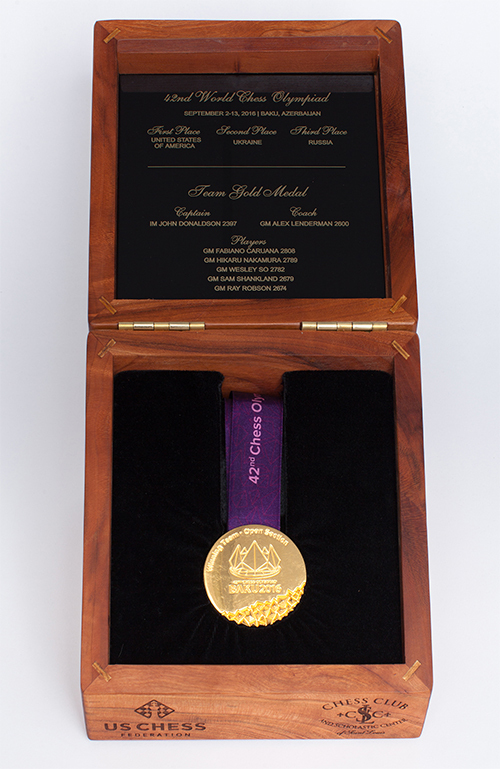 Many of these treasures have never been exhibited at the WCHOF. 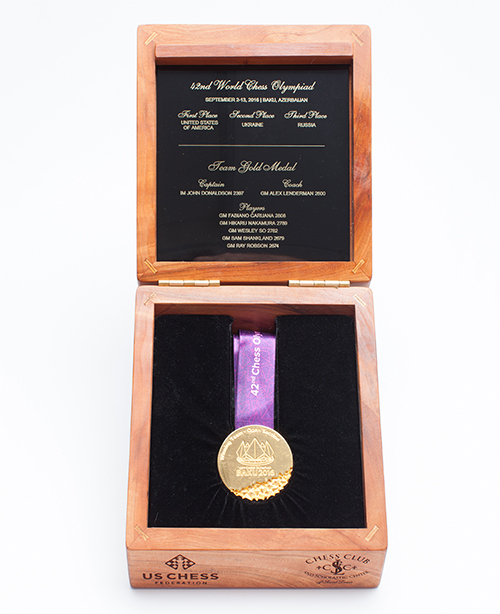 The organization of Global Moves has resulted in several new donations to the WCHOF, including artifacts from the collections of Grandmasters Arthur Bisguier and Isaac Kashdan as well as Jacqueline Piatigorsky and Dorothy Teasley’s medals from Women’s Chess Olympiads. We have also taken this opportunity to have one of the highlights of our collection, a suite of furniture from the 1966 Havana, Cuba, Chess Olympiad, conserved, restoring a beautiful piece of chess history. Off view since the WCHOF relocated to Saint Louis from Miami, we are proud to present it along with a video from the 1966 Olympiad, showing tables from the tournament in use. The exhibition also includes a video produced for the exhibition featuring interviews with the American team from the 2016 Olympiad and several commentators who have participated in Chess Olympiads or Women’s Chess Olympiads themselves. 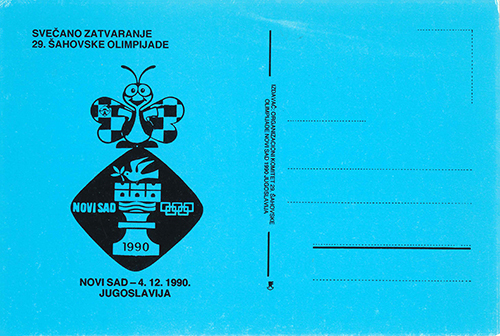 Longer excerpts of these interviews are also included in this brochure, along with an essay by GM Lubomir Kavalek, a member of the gold medal-winning 1976 Olympiad team. 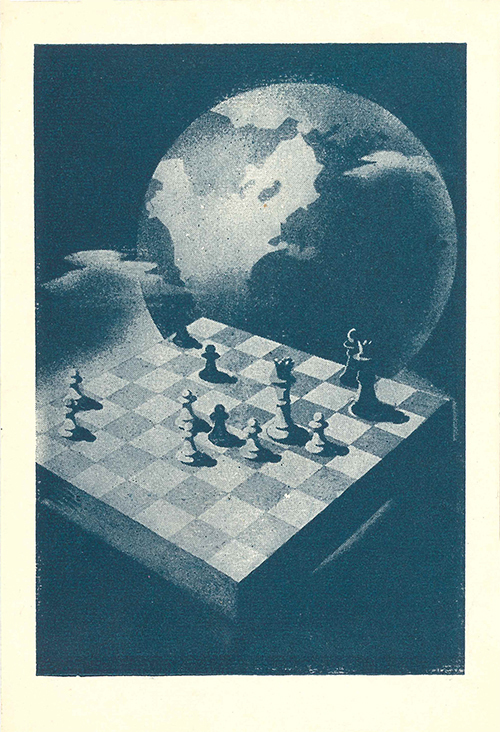 It is our hope that through presenting these materials, Global Moves honors the rich legacy—and bright future—of the American chess. 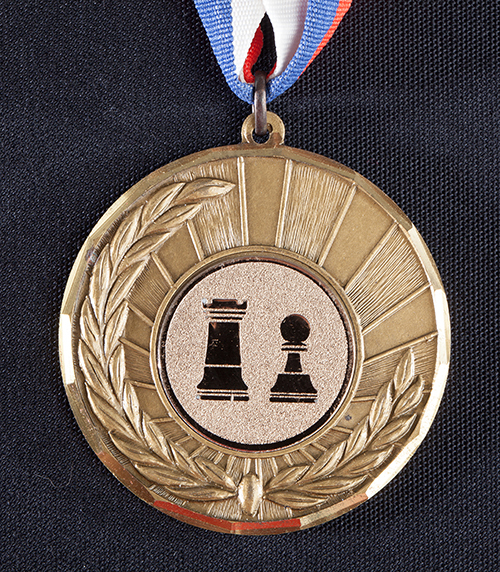 Winning team gold at Chess Olympiads can be elusive. The Russians have not done it since 2002, and in the 90-year history of these competitions, Americans have won it only six times. Four of those triumphs came before World War II. Only U.S. Chess Champion Frank Marshall played on all four teams, earning four team gold medals. Three times the U.S. victories were in jeopardy on the last day of play, and only luck helped to clinch the gold. 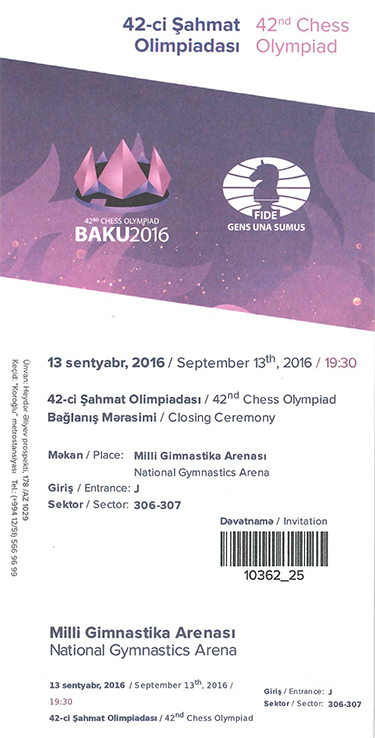 In the most recent Olympiad in Baku, the Americans fielded an incredibly strong team. Three members—Grandmasters Fabiano Caruana, Hikaru Nakamura and Wesley So—were rated among the top 10 players in the world. But in the last round Grandmaster Sam Shankland lost his game, and the gold medals were up for grabs. 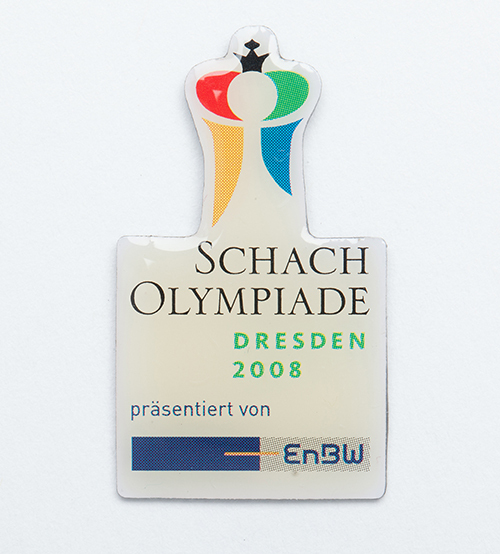 Nothing could be done because under a strange tiebreaking system the gold medals were hanging on a game from the match Estonia-Germany. Tarvo Seeman had a draw in hand that would have given the overall victory to Ukraine, but he did not see it and the U.S. team could celebrate. It was a great success: 175 countries registered to play in Baku and among the contenders, only Armenia, the winners from 2006, 2008 and 2012, did not take part. 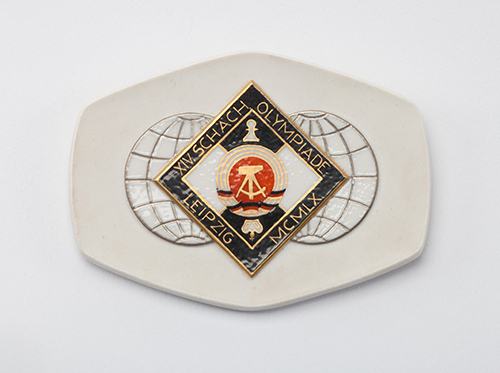 Before World War II, when the Americans were a dominant force, not more than 20 teams participated in the Olympiads in which they competed. 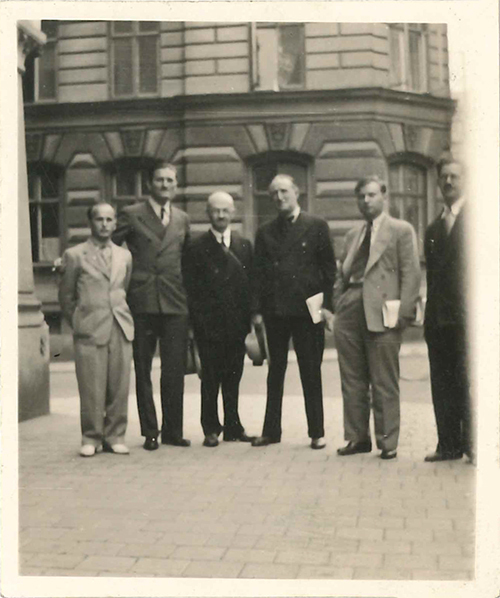 In the 1933 Folkestone Olympiad the strong U.S. team of Isaac Kashdan, Frank Marshall, Reuben Fine, Arthur Dake and native Albert Simonson was coasting toward first place. They could have even lost in the last round to their main rival, the Czechoslovakian team, with the score of 1-3 and still managed earn the gold. Everything went wrong early in the match. Around move 17, Kashdan, Fine, and Simonson were already utterly outplayed, and Frank Marshall could only hope for a draw. A loss of ½-3 ½ was very possible. The gold could have disappeared right there, but their fortunes changed on a dime. Fine’s opponent Josef Rejfir did not see the winning double-piece sacrifice and Fine escaped. Marshall exploited Karel Treybal’s mistake and turned a draw into a win. 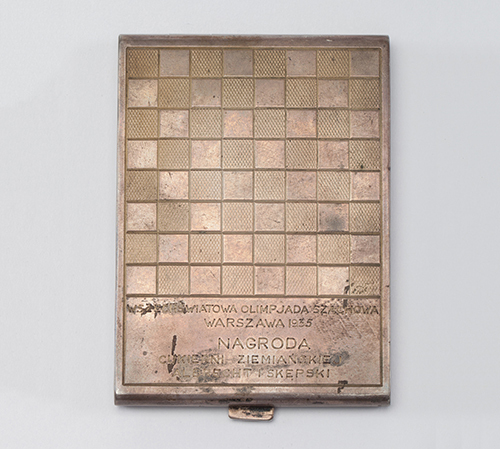 Although the Americans lost the match against the Czechs 1 ½ - 2 ½ , the overall victory was secured. 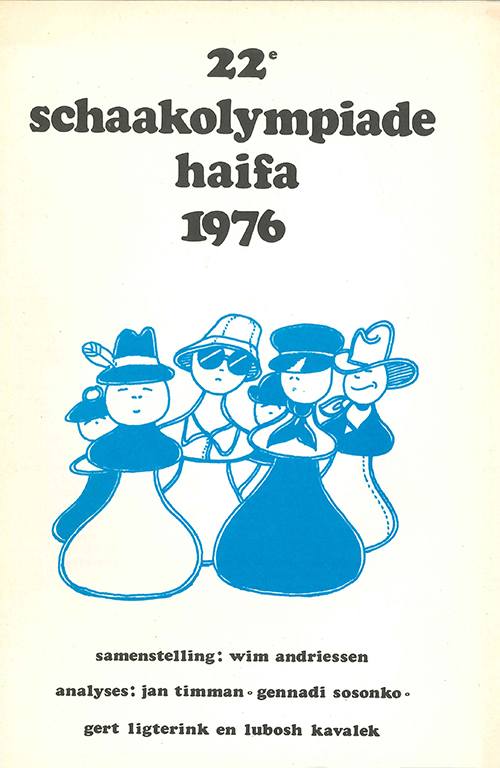 The Olympiad in Haifa in 1976 was played for the first time under the Swiss pairing system with 46 teams competing in 13 rounds. As in Dubrovnik, Yugoslavia, in 1950, the Soviets and its communist allies stayed home. It was my third Olympiad with the U.S. team. A story similar to Folkestone played out during the match of two contenders, the U.S and the Dutch teams. Robert Byrne quickly lost to Jan Timman and just before the time control Jim Tarjan blundered against Jan Hein Donner. I pressed too hard against Genna Sosonko and adjourned in a hopeless position. William Lombardy could not hope for more than a half point. We were looking at an embarrassing ½-3 ½ defeat, but like our predecessors in Folkestone, we turned it around. Hans Ree resisted Lombardy’s pressure for 60 moves, but his next move was a blunder and he lost. Sosonko was on his way to victory, but fumbled on move 71. My h-pawn sprinted fast and secured a draw. It was our trademark in Haifa to score much better than expected in the adjournments. We tallied 6 ½ points more than we should have objectively gained. Bill Goichberg was the U.S. team captain and Pal Benko was the team analyst. The match was played in the first half and we quickly fell behind the Dutch team. With three rounds to go, we were still 2 ½ points behind them. Bad form is an uninvited guest at the Olympiads and could be unpredictable. Tarjan and I struggled in Haifa and had the worst results on the team, but two years later in Buenos Aires, Argentina, we were the best performers. 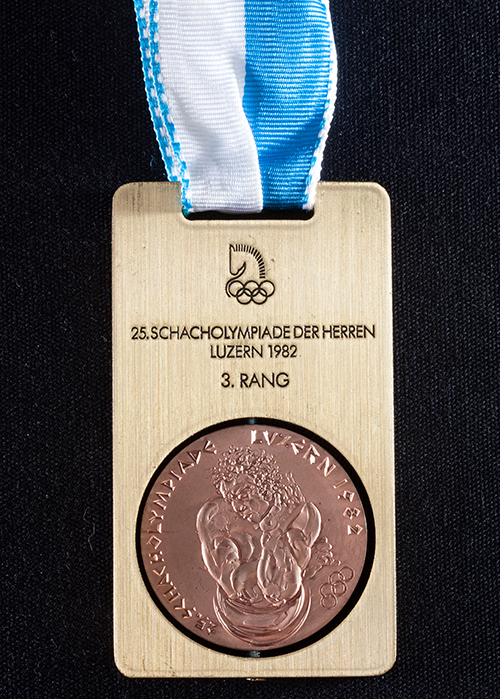 Tarjan ended his Olympiad career as one of the most successful American players with two gold and one silver individual medals. I finished in Haifa on a high note, winning the last two games, although I missed a queen sacrifice against Werner Hug, precisely the one that won World Chess Champion Magnus Carlsen the 2016 World Chess Championship match against Sergey Karjakin in New York. We caught the Dutch team just in time before the last round started. The veterans Byrne, Larry Evans and Lombardy performed well throughout the event and won their last games against Wales. But our best performer Kim Commons misplayed his advantage and was in trouble. Did his opponent seal a winning move? Commons’ opponent John Cooper was fighting for an individual board prize in Haifa. A win was important to him, but he did not seal the best move. Surprised by Commons’ reply, he ran into time trouble and offered a draw. The U.S. team was done but could not control who would win the gold medals. 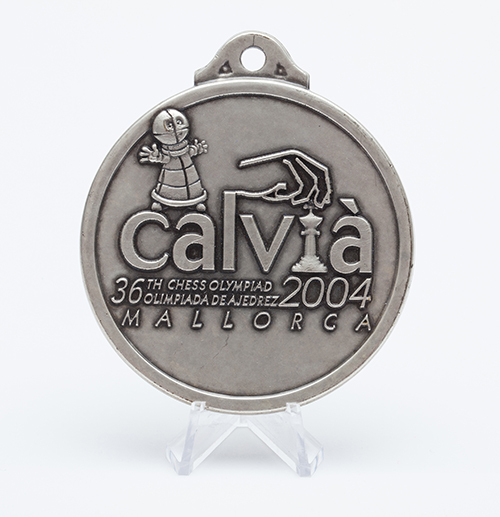 The fate of those medals was in the hands of Ilkka Saren, a relatively unknown chess master from Finland. His Dutch opponent, Frans Kuijpers, had to win the game to secure the top spot for his team. It was the last game of the event, and it went on for hours with no end in sight. Nervous chess players were pacing back and forth in the reception hall of the Dan Carmel Hotel, where the event was played. Occasionally, somebody came from the tournament hall to confirm that nothing dramatic had happened. On move 70, Kuijpers moved a pawn, a sign he wanted to prolong the marathon game by another 50 moves. Did he want to wear Saren down? We admired the stoical look on Saren’s face. Where did it come from? We did not know that in the last championship of his country Saren fought for 159 moves. Equally, we were not aware why Kuijpers did not trying to break on the kingside. It was risky, but it was his only winning attempt. Only later did we learn that he made a similar risky bid the previous December in a team match against England and got burned. There they were, two players moving back and forth, caught in their past. 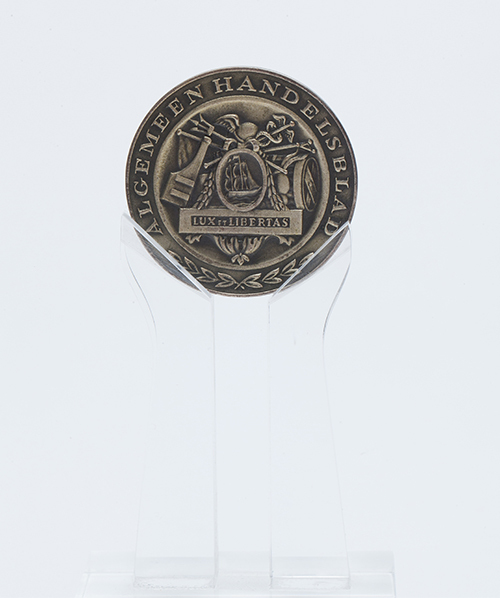 After 111 moves and 14 ½ hours they agreed to a draw and we won the gold, and the Dutch got the silver. In 1968, I was nominated to play the top board for Czechoslovakia at the Olympiad in Lugano, Switzerland, but after the Soviet-led invasion of my native country, I escaped to the West. I could not have predicted that I would end up playing for the United States in seven Olympiads, three times on the top board, twice on the second, winning one gold and five bronze team medals. 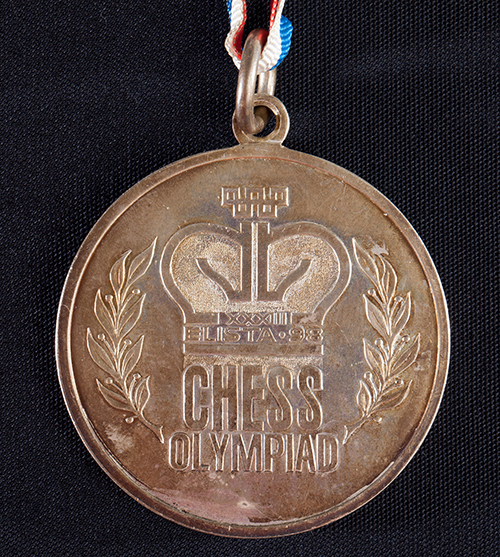 Only after my professional chess career was over, did I realize that with the help of 19 different teammates I won six Olympiad team medals, the most by any American player since 1928. 19 x 12 ½ x 8 ½ in. 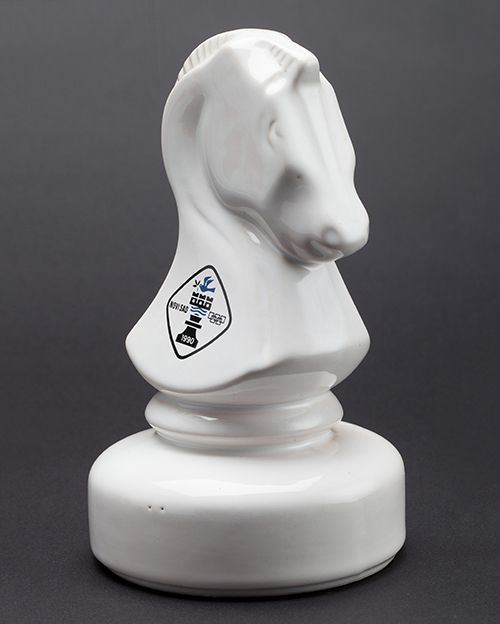 Created in 1927 and presented to the World Chess Federation (Fédération Internationale des Échecs or FIDE) by Frederick Gustavus Hamilton-Russell, this trophy celebrates the accomplishments of the winning teams in the open section of the Chess Olympiad. 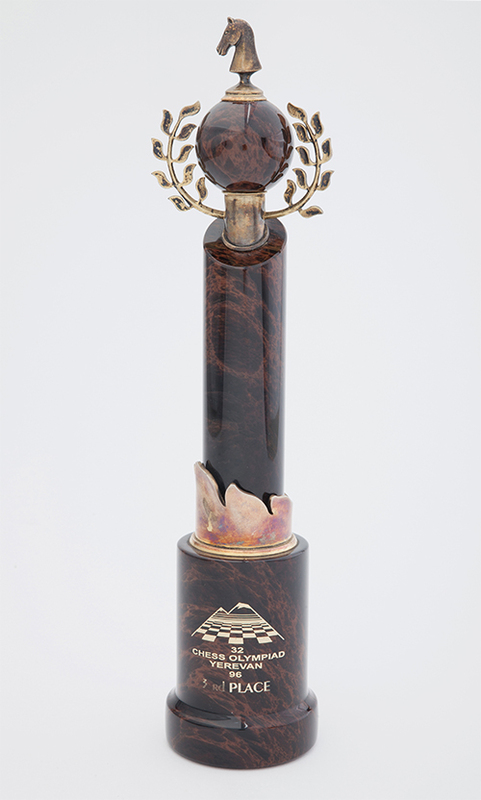 Teams from around the world compete in the biennial tournament, and the first-place team takes custody of this trophy until the next Olympiad. 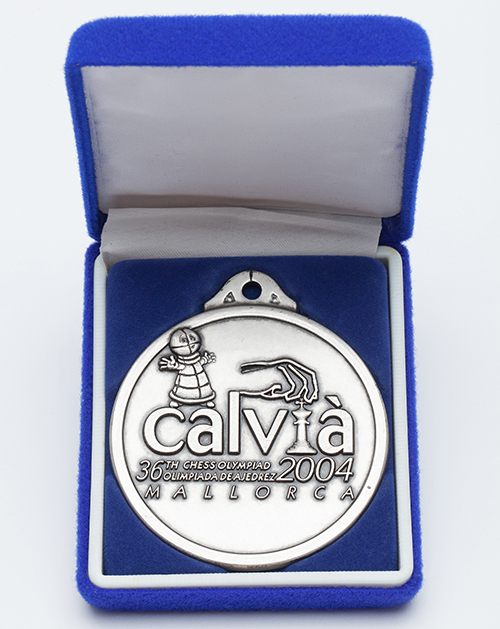 The trophy’s base displays the names of the winning teams. 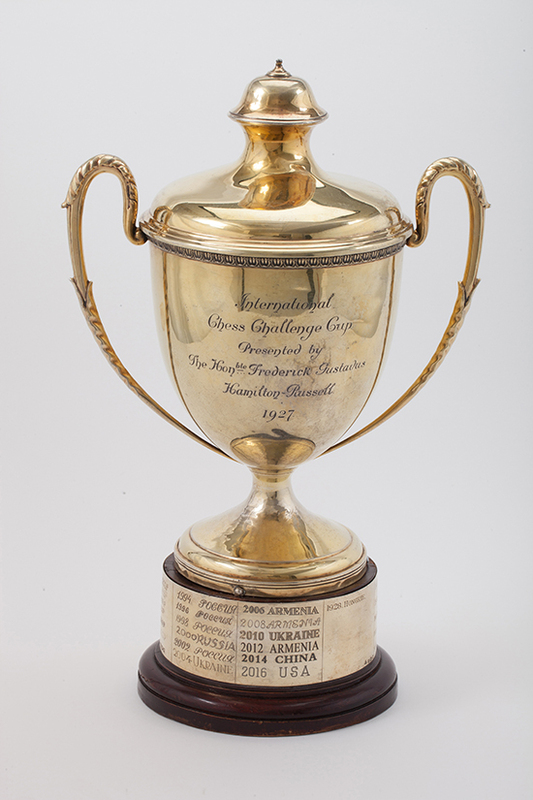 The Hamilton-Russell Cup is currently in the care of the World Chess Hall of Fame and US Chess due to the victory of the American team in the open section of the 2016 Chess Olympiad, which was held in Baku, Azerbaijan, from September 1 to 14, 2016. The American team included Grandmasters Fabiano Caruana, Hikaru Nakamura, Ray Robson, Sam Shankland, and Wesley So. International Master John Donaldson served as team captain and Grandmaster Aleksandr Lenderman served as team coach. Caruana, Nakamura, and So participated in the 2017 Grand Chess Tour. 3⁄8 x 4 ¼ x 3in. 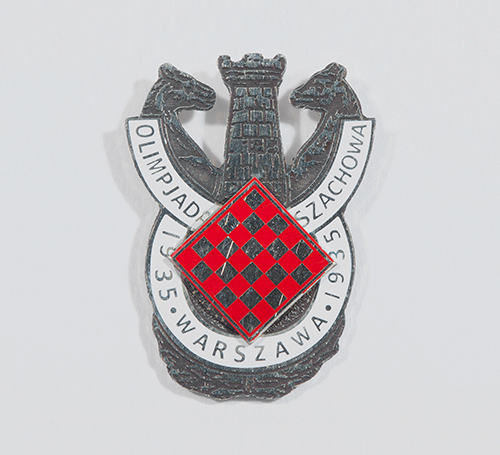 This pin reproduces the logo of the 1935 Warsaw, Poland, Chess Olympiad, with two knights flanking a tower. Jerzy Steifer, an amateur artist, created the distinctive design. Steifer served in the Polish Navy and died during the Battle of Kock in 1939, when the Germans invaded Poland. During this Olympiad, Grandmaster Arthur Dake played every game except one—the round against the Polish team—in deference to his father’s history as an immigrant from that country. 2 9⁄16 x 2 1⁄8 in. 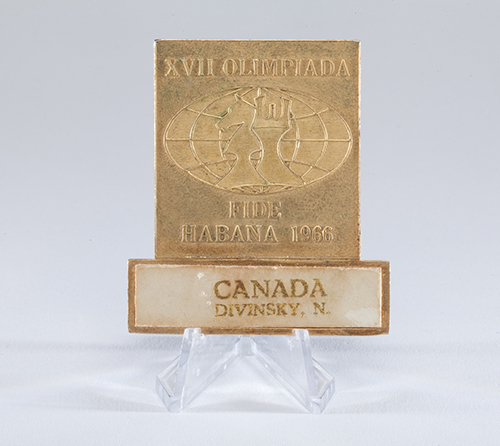 1937 marked both the last year the United States would win team gold in the 1930s and the debut of former chess prodigy Grandmaster (GM) Samuel Reshevsky in the competition. Reshevsky, who immigrated to the United States from Poland in 1920, had only returned to competitive chess in 1933 after leaving it to focus on his education. In his childhood, he had earned fame across the country for his performance in simultaneous matches, emerging victorious against opponents who were much older than him. One of his early supporters, GM Frank Marshall, was also on the team. Marshall and International Master Al Horowitz ended the competition undefeated. Unfortunately, this would be the last time the United States participated in the competition before World War II. 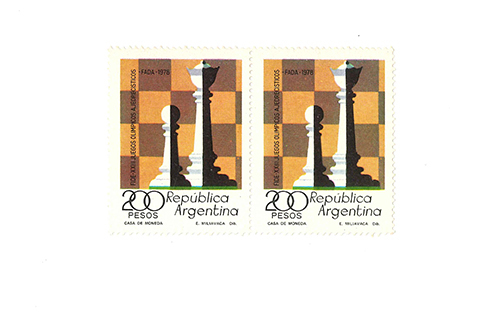 In 1939, Buenos Aires, Argentina, hosted the Chess Olympiad, the American team was not able to attend due to funding issues. The competition would then go on hiatus during the entirety of World War II, and the United States would not win team gold again until 1976. 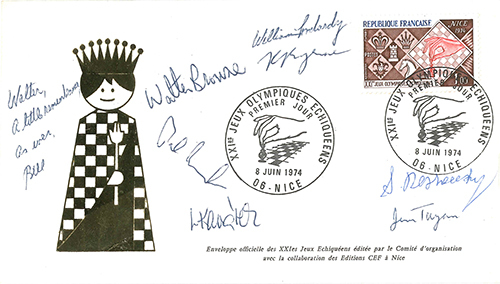 Organization of the Chess Olympiads was suspended during World War II and the following years. In 1950, they restarted, and the landscape in the chess community had changed. On the global level, some players who had been the most prominent in the era before the war, such as World Chess Champions Alexander Alekhine and José Raúl Capablanca and U.S. Chess Champion Frank Marshall, had passed away before the Olympiads resumed. Others such as Dawid Przepiórka died in the Holocaust. Some, like Grandmaster Miguel Najdorf, became refugees and settled in new countries. 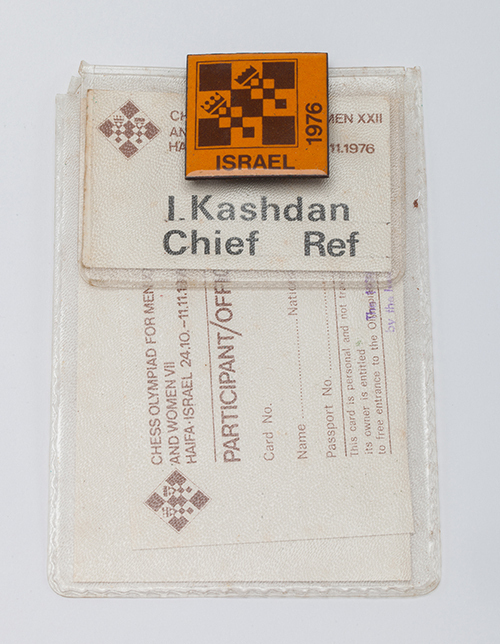 In the United States, some players including Isaac Kashdan had largely left competitive chess due to diminished opportunities to play and needed to support their families. 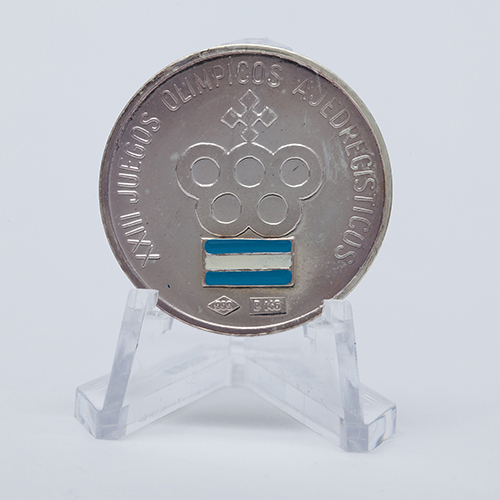 The Soviet Union began competing in Olympiads in 1952, establishing an era of dominance in the competition that would last until 1990. In the 1950s and 1960s, competition between the United States and the Soviet Union was often influenced by the tensions of the Cold War. 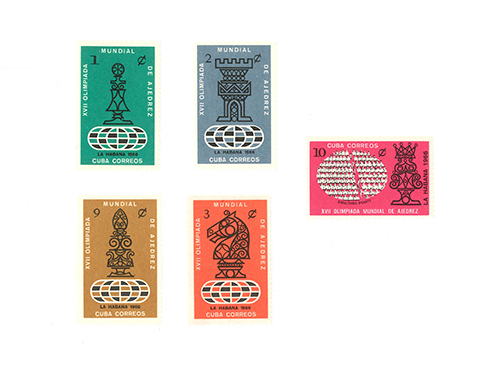 1957 also marked the organization of the first Women’s Chess Olympiad. Chairs: 33 x 22 x 18 in. Table: 30 x 45 x 36 in. Board: 7⁄8 x 19 ½ x 19 ½ in. 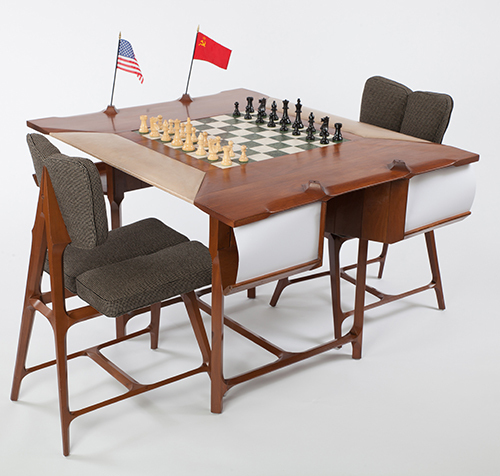 Created for the 1966 Havana, Cuba, Chess Olympiad, this table and chairs is one of the highlights of this exhibition. The table has multiple features designed for the comfort of players, including leather armrests and spaces to store belongings. The Havana organizers made special efforts to make this one of the best Olympiads in history. 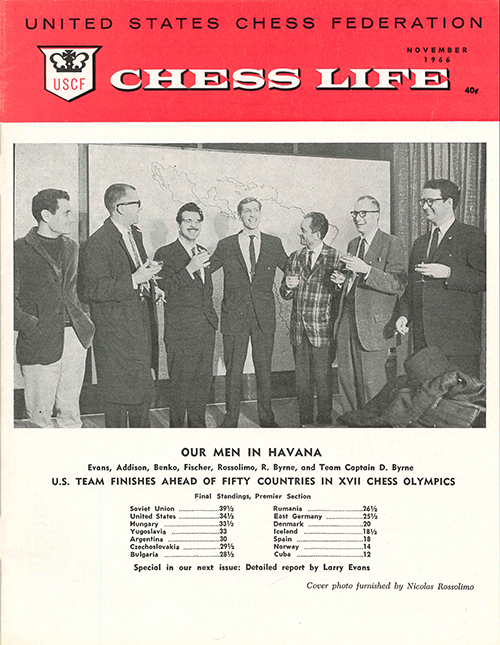 In a December 1966 article in Chess Life, U.S. team member Larry Evans noted that it was the “biggest, best organized, and best run to date” and that organizers reportedly spent 1.3 million pesos on the event. It is unknown how many tables were made, but International Master (IM) John Donaldson has estimated 104-120. 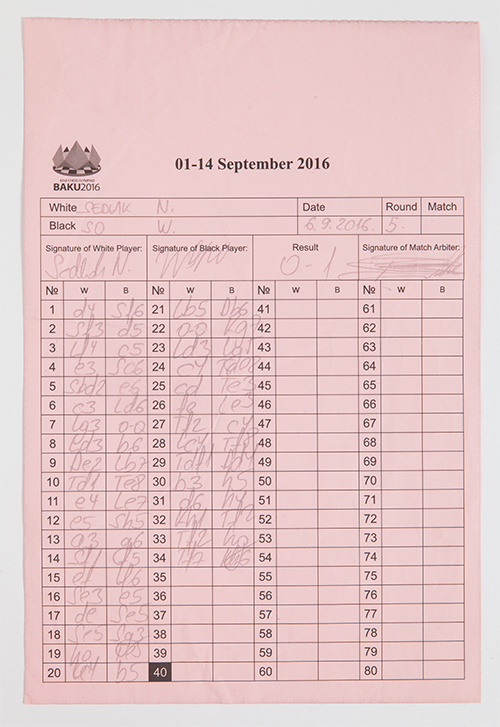 Since the tables were used continuously throughout the tournament, it is impossible to tell which players competed at specific tables. 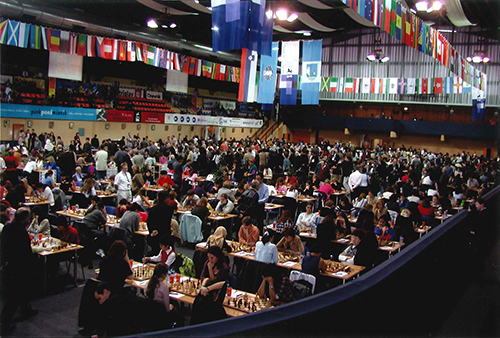 After the Olympiad ended, organizers sent tables to Board One players and important FIDE (Fédération Internationale des Échecs or World Chess Federation) officials around the world. Fred Cramer, then Zonal President for the United States, received this one. The table has replica flags, chess pieces, and name placards. The chess set displays a position from Grandmaster Bobby Fischer’s 1966 Olympiad game against IM Jacek Bednarski, which Fischer included in his book My 60 Memorable Games (1969). 5 ½ x 3 5⁄8 in. 8 3/4 x 5 9⁄16 in. 2 ½ x 7 5⁄16 in. 1 ¾ x 1 1⁄8 in. 2 1⁄8 x 1 7⁄8 in. 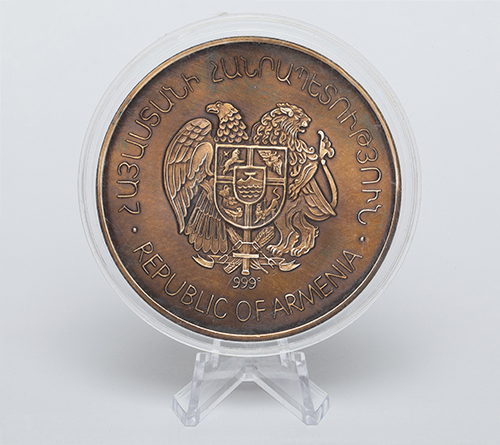 Medal: 2 7⁄16 x 3 3⁄8 in. Box: 3 ¾ x 4 ¼ in. 11 x 8 ½ in. The 1970s and 1980s marked a moment of transition for American Chess Olympiad teams. New talent from the Soviet Union and Soviet bloc countries, including Woman Grandmaster Anna Gulko (Akhshuramova), Grandmaster (GM) Boris Gulko, and GM Lubomir Kavalek, joined teams that included both legends of the 1950s and 1960s and rising American players like GM Walter Browne, Woman International Master (WIM) Diane Savereide, and GM Yasser Seirawan. 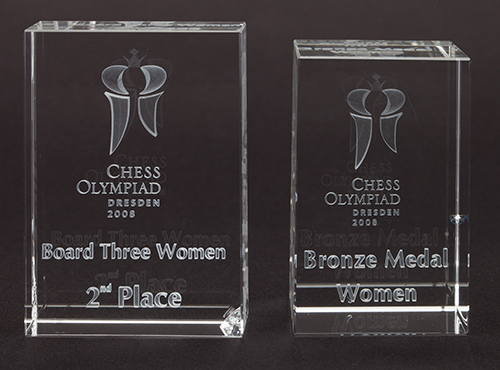 In 1972, the Women’s Chess Olympiad began to be held at the same time as the Open (or at that time, Men’s) Olympiad. 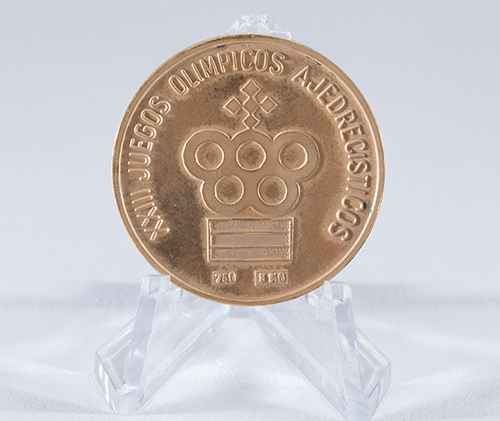 This exhibition contains artifacts related to several Olympiads of the 1970s and 1980s, as well as medals won by the American team during this period. 3 5⁄8 x 6 7⁄16 in. 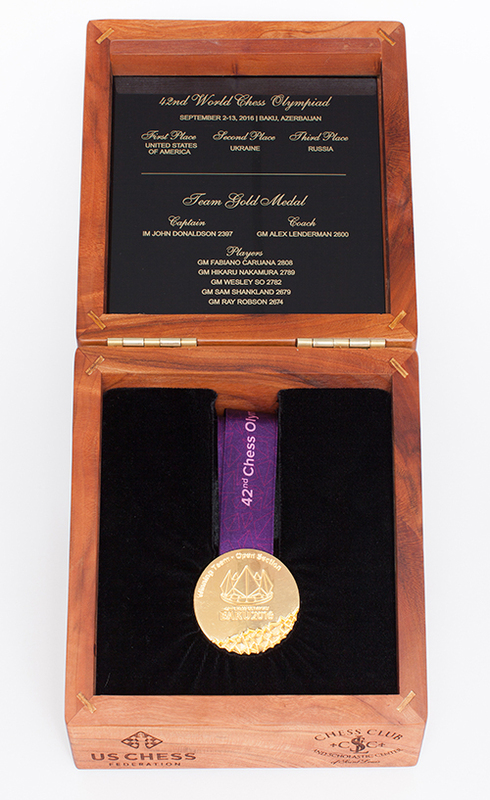 Medals: 2 1⁄8 in. dia. Stand: 4 ½ x 6 ¼ in. Grandmaster (GM) Lubomir Kavalek played in nine Olympiads—two for his native Czechoslovakia and the last seven for the United States. He made his first appearance as an American in 1972, when interest in the game was high as a result of the recently concluded Bobby Fischer-Boris Spassky World Chess Championship match. American planners hoped to organize a team of the strongest American players, with World Chess Champion Fischer at its center, in order pose a serious challenge to the Soviet team, which had dominated the Olympiads since the 1950s. Initially, Coca-Cola agreed to provide $100,000 in sponsorship for the American team, but they had one condition—Fischer had to play. 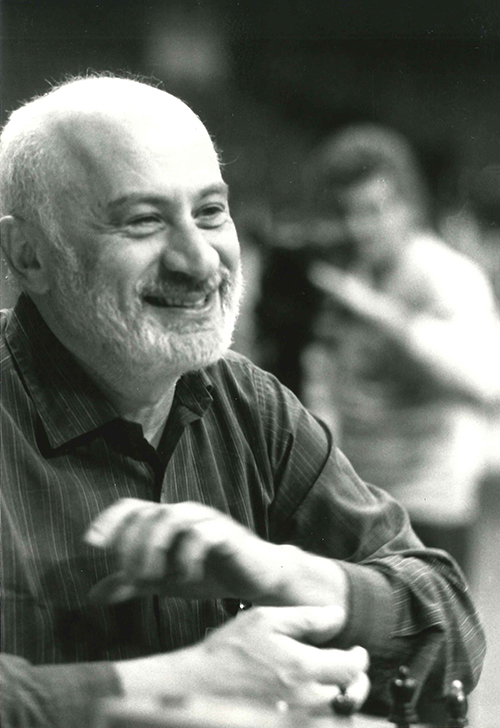 When he dropped out, the plan began to fall apart, and a number of the most talented American players (GMs Samuel Reshevsky, Larry Evans, Pal Benko and William Lombardy) declined to play. The result was the U.S. fielded one of its weakest ever teams and finished ninth. Despite this disappointment, Kavalek, who scored 11 ½ out of 18 on Board One, still impressed in his American debut. Every other American team he played for over the course of his career medaled. Before representing the United States in the Chess Olympiad, GM Walter Browne twice competed on behalf of Australia, his mother’s native country. 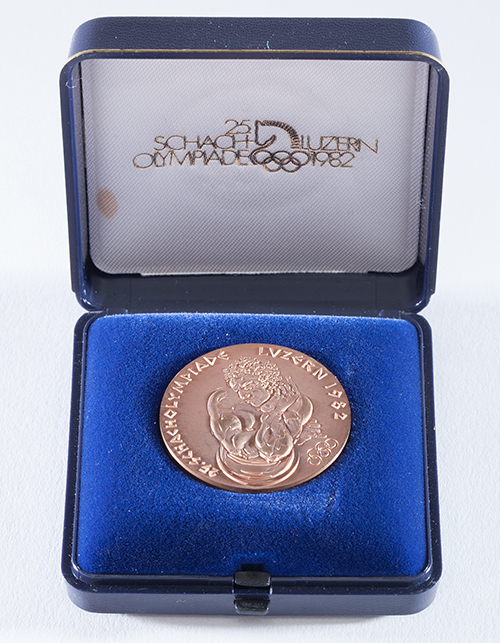 In 1972, Browne earned an individual bronze medal for his efforts. 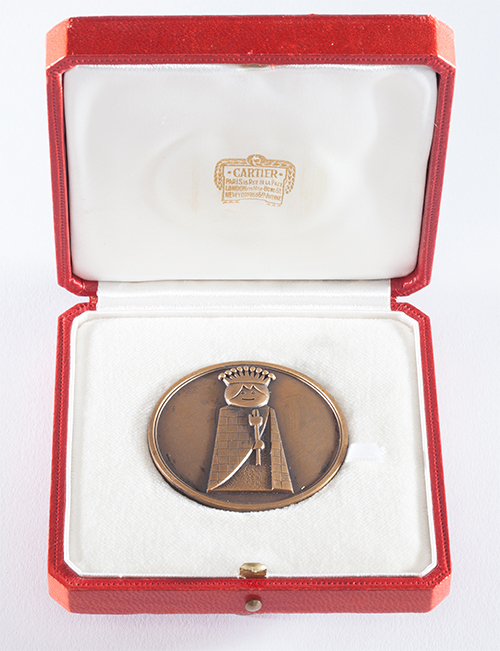 This medal is part of a donation of Browne’s archive, which Browne’s wife Raquel gifted to the World Chess Hall of Fame after his 2015 death. The U.S. sent a strong team to the Nice, France, Chess Olympiad. Headed by GM Lubomir Kavalek, the 10th-rated player on the May 1974 FIDE rating list, it also featured GM Robert Byrne, who placed third in the 1973 Leningrad Interzonal to qualify for the Candidates Matches. The team, led by Byrne’s score of 12 from 16, finished third. It was the first time the U.S. had medaled in eight years. Byrne holds the record for most games completed in the competition by an American—116 games. 1 1⁄8 x 2 ¼ in. Pin: 1 7⁄8 x 1 7⁄8 in. Pass: 5 1⁄8 x 3 ½ in. 9 5⁄16 x 4 3⁄16 in. 9 1⁄8 x 4 3⁄16 in. 8 ¼ x 5 5⁄8 in. 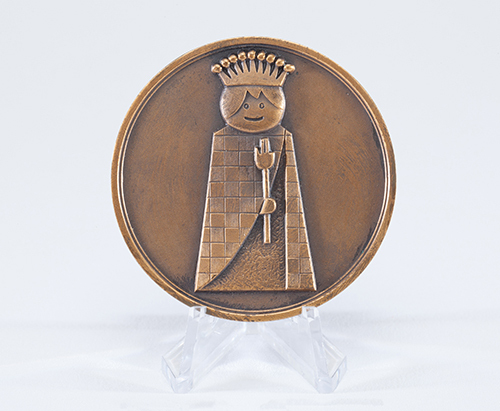 The 23rd Chess Olympiad in Buenos Aires was a repeat of the success of 1974 for American reserve player GM Jim Tarjan, who scored 9 ½ from 11 to once again win individual gold and team bronze medals. Tarjan’s 5 ½ points from the last six rounds made the difference between an excellent and acceptable result for the U.S. team. His performance rating of 2709 was the second-highest of the Olympiad behind only the legendary player GM Viktor Korchnoi. GM Jim Tarjan was one of America’s best players during the 1970s and early 1980s. He represented the U.S. on five Olympiad teams during this era, winning four team and three individual medals. His Olympiad debut in Nice, France, was nothing short of sensational and a sign of things to come. Tarjan finished his Olympiad career with a lifetime winning percentage of 76 percent, which is among the highest ever achieved by an American who has played more than one event. His performance has only been exceeded by GMs Sam Shankland (81 percent) and Isaac Kashdan (80 percent). Born in Prague, Czechoslovakia, GM Lubomir Kavalek became the youngest player to win the Czech Championship at age 19 in 1962. He would repeat the feat again six years later. 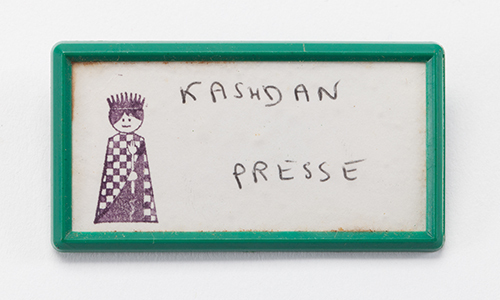 In 1970, he immigrated to the US, where he completed his studies in journalism and literature. During the 1970s, he won or tied for first in the U.S. Chess Championship three times and was rated in the world’s top 100 players continuously from 1962 to 1988. A veteran of nine Olympiads, Kavalek represented Czechoslovakia twice and the U.S. seven times. He also won more than 20 important tournaments over the course of his career. Today, Kavalek is the chess columnist for the Huffington Post. WIM Dorothy (Dolly) Teasley is one of only eight American women to have won individual medals in Chess Olympiads. She scored 7 ½ from 10 to win a bronze medal as the third best reserve player in 1978. 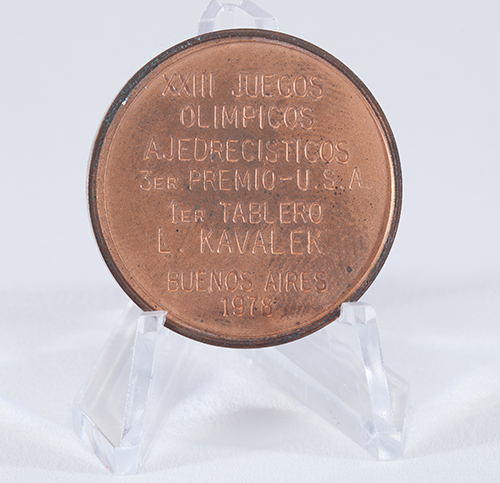 A five-time competitor in the U.S. Women’s Chess Championship, Teasley fondly remembers the 1978 Buenos Aires, Argentina, Chess Olympiad, and upon donating this medal to the World Chess Hall of Fame, related a story of that year’s team captain, International Master (IM) Anthony Saidy. She stated, “Dr. Saidy was given a $1000 emolument [fee] from the USCF [today US Chess]. What did he do with it? He split it five equal ways amongst the four team members and himself. We all received an unexpected windfall of $200 (equivalent to about $778 today). It was a princely gift.” In an article for Chess Life about the Olympiad, Saidy interviewed the reigning Women’s World Chess Champion, Maya Chiburdanidze, who is from the country of Georgia, which is renowned for its number of extraordinary female players. He humorously stated that the reason Georgia produced these players was not something “in the yogurt” there; rather, it was the support and training offered to young female players. He suggested that the United States follow suit to develop its young talents. 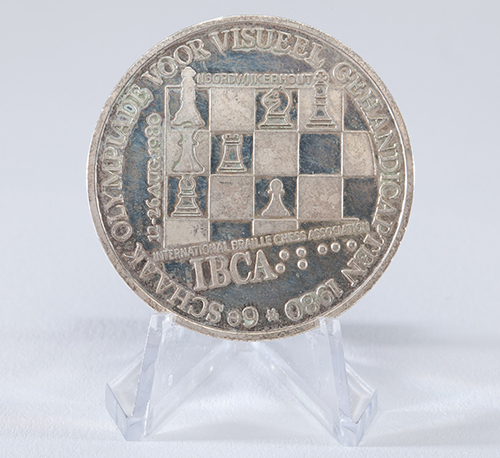 Michael Garner won this silver medal for his performance in the second Blind Chess Olympiad. The competition has been held since 1961 and is organized by the International Braille Chess Association, a group that supports players who have visual impairments. 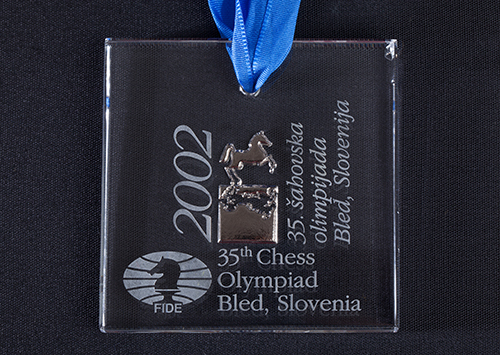 Only eight teams competed in the first Blind Chess Olympiad, but the tournament has grown slowly since. Four-time U.S. 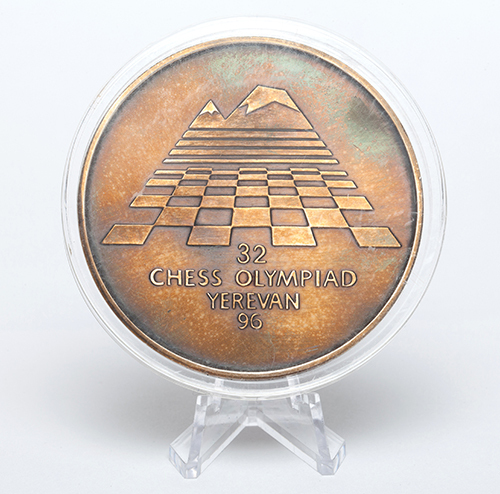 Chess Champion Yasser Seirawan represented the U.S. in 10 Olympiads between 1980 and 2002, and his lifetime winning percentage of 65 percent is particularly impressive considering he played most events on Board One or Two. GM Jim Tarjan often led the U.S. teams that took home bronze medals five times between 1974 and 1986. 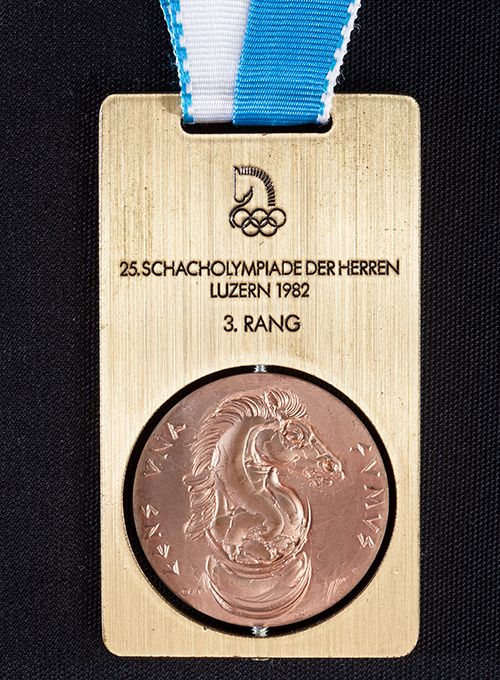 In the 1982 Lucerne, Switzerland, Chess Olympiad—his final appearance in the competition—he won an individual bronze along with the team medal by scoring 7 from 9 for a 2688 rating performance. 2 13⁄16 x 1 9⁄16 in. 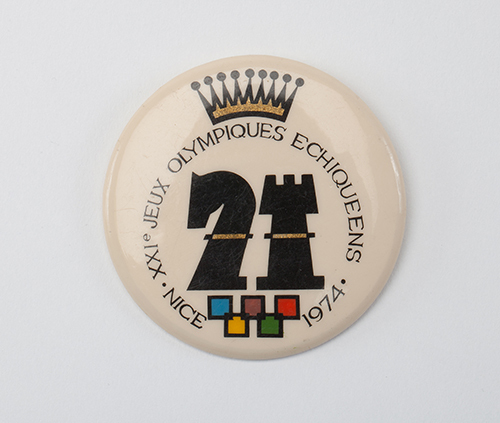 The Swiss city of Lucerne organized the 1982 Chess Olympiad in impeccable style. Unlike most Olympiads, the United States entered this event as one of the favorites, seeded second a point ahead of Hungary. 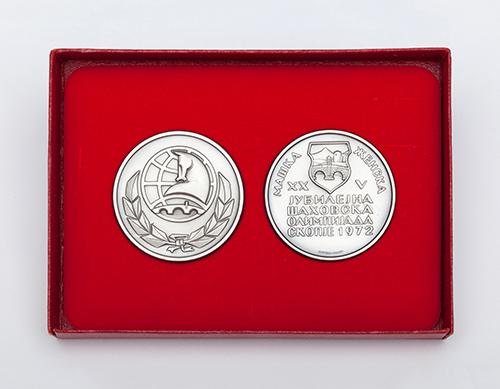 The surprise of the event was Czechoslovakia, which finished second, the first time it had medaled since 1933. 3 ½ x 4 2⁄5 in. The Soviet Union, which often fielded a lineup of six of the best players in the world, was by far the most difficult opponent for American teams between 1952 and 1990. The Sovies were dominant in the competition—in 18 matches they scored 14 match victories and two draws against only two defeats. US. teams of the 1950s, 60s, and 70s suffered, but the matches became much more competitive in the 1980s with the Americans winning in 1984 and 1986. 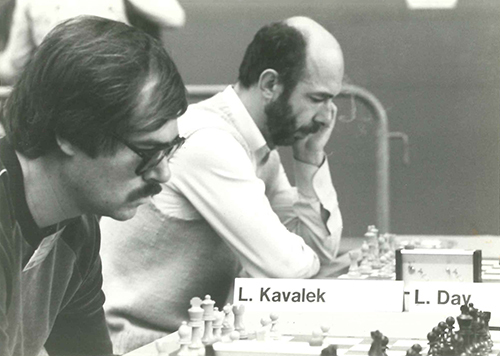 The heroes in 1984 were GMs Nick de Firmian and Roman Dzindzichashvili. The latter played only one Olympiad, but he had a great performance, as he scored 8 out of 11 on Board One to lead the U.S. to third place. 3 ¾ x 2 in. 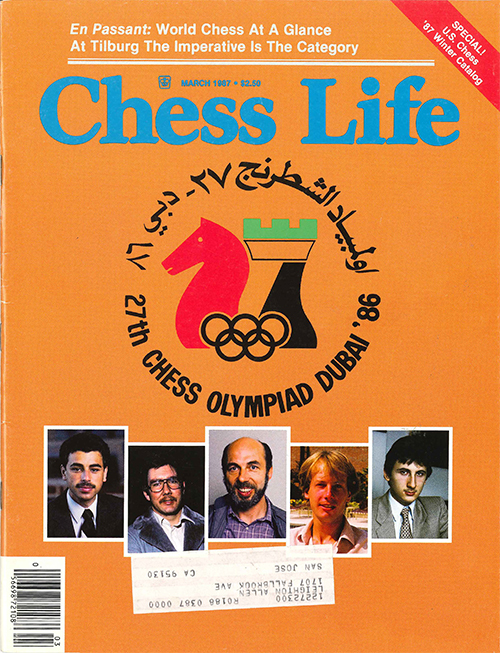 The fifth-seeded United States team of GMs Yasser Seirawan, Larry Christiansen, Lubomir Kavalek, John Fedorowicz, Nick de Firmian, and Maxim Dlugy performed tremendously in the 1986 Dubai, United Arab Emirates, Chess Olympiad. They led for most of the event after defeating perennial favorites Hungary and the Soviet Union. 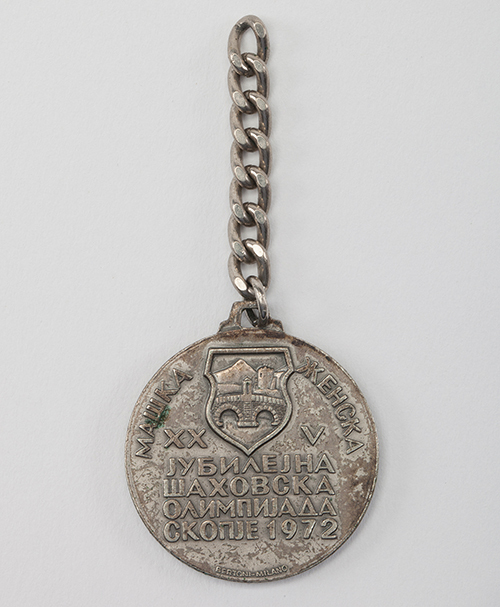 After 13 rounds, the Americans had won 11 matches, drawn one, and lost one, to lead with 36 ½ game points, to the Soviet Union’s 36 and England’s 35 ½. Unfortunately for the U.S., in the last round both its rivals went 4-0, while it could only draw 2-2 against Bulgaria. It would have been a tremendous upset if the Americans had been able to win gold since the Soviets outrated the American team by an average of 126 rating points per board. 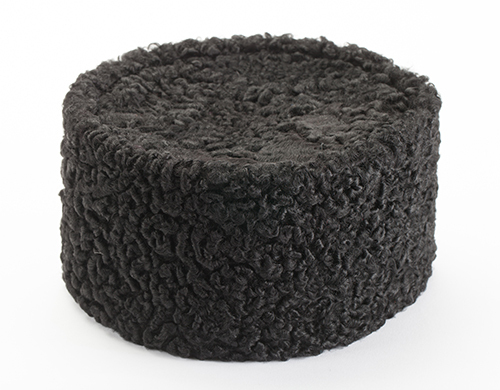 10 5⁄8 x 8 ¼ in. 1 3⁄8 x 1 ¾ in. 3 15⁄16 x 5 7⁄8 in. Grandmaster Larry Christiansen is a three-time U.S. Champion, who has represented his country in nine Chess Olympiads and won five team medals. Christiansen won the game against GM Hjartarson, leading the United States to a 3-1 victory over a strong Icelandic team. 4 x 5 13⁄16 in. 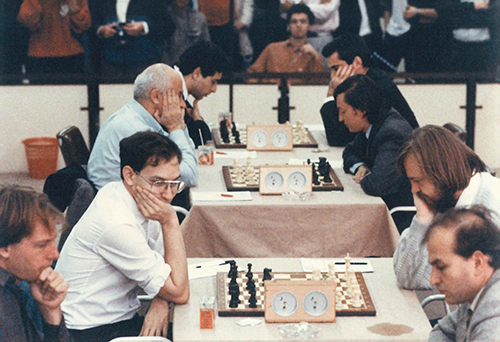 1988 marked an important milestone in American chess. For the first time, the United States fielded an all-master team headed by top boards Woman Grandmaster Anna Akhsharumova and six-time U.S. Women’s Chess Champion Diane Savereide. 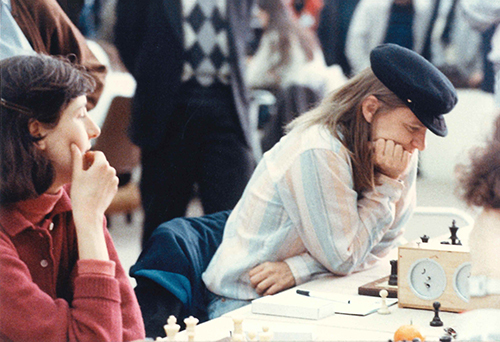 Savereide was the dominant U.S. women’s player through the 1970s and 1980s, and only the second American woman to achieve a master’s rating; as such, she inspired a new generation of American women chess players. 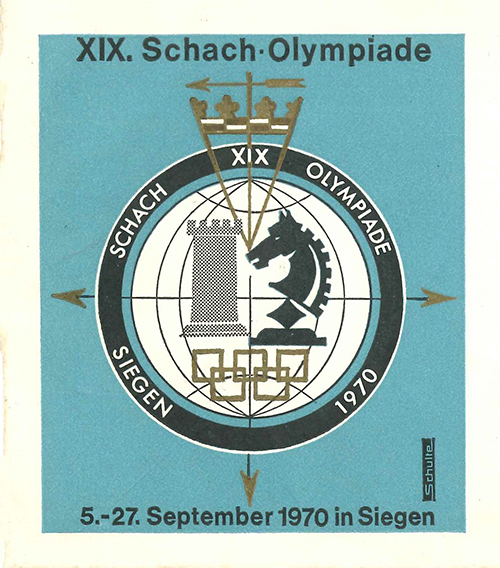 The team drew matches against top seeds China, Soviet Union, and Yugoslavia, losing only to a Hungarian team led by Grandmaster Susan Polgar, to finish ninth. 4 x 5 ¾ in. Four-time U.S. 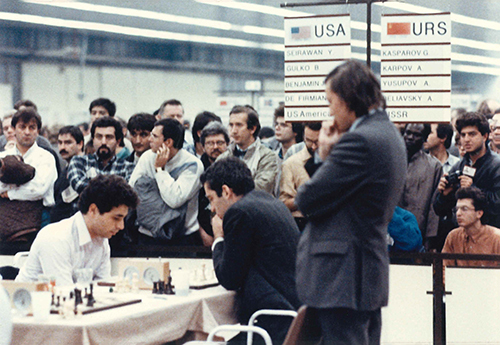 Chess Champion Yasser Seirawan and World Chess Champion Garry Kasparov of the Soviet Union, who compete before an attentive group of spectators in this photograph, traded individual wins and team victories in 1986 and 1988. 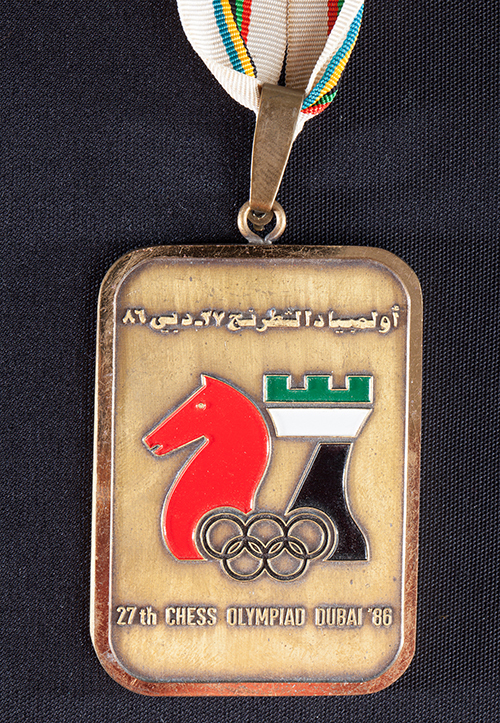 Seirawan and the U.S. team won in 1986 in the Dubai, United Arab Emirates, Chess Olympiad by a score of 2 ½-1 ½. Two years later, Kasparov and the Soviets got their revenge by an identical margin. 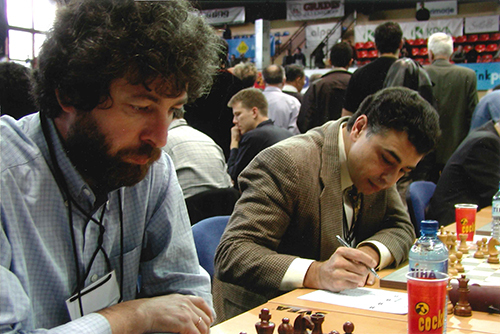 Pictured in the foreground of this photograph, American Grandmasters Joel Benjamin and Nick de Firmian competed on six and eight U.S. Olympiad teams respectively. Benjamin is a winner or co-winner of virtually every major U.S. title, including six World Opens and three U.S. Opens. He has competed in a record 23 consecutive U.S. 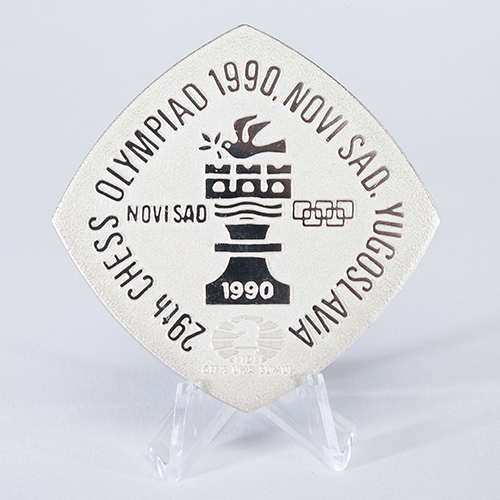 Chess Championships, winning three (1987, 1997, 2000). 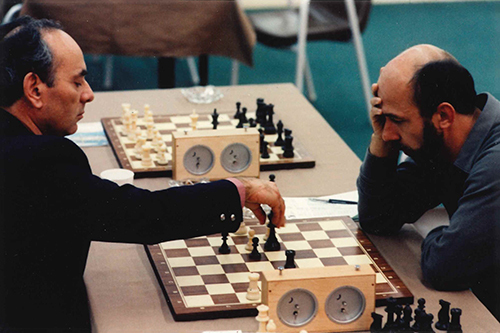 Benjamin also served as the official grandmaster consultant for IBM’s Deep Blue computer, which in 1997 claimed a historic victory over World Chess Champion Garry Kasparov, who also appears in this photograph. De Firmian is a three-time U.S. chess champion (1987, 1995, 1998). The well-balanced teams of the 1990s featured many players of similar strength. American teams twice won silver medals and one took bronze in the open section in the 1990s. 4 1⁄8 x 6 1⁄8 in. Case: 4 ¾ x 3 ¾ in. 7 ½ x 4 ½ in. 13 ¾ x 3 ¼ in. 5 15⁄16 x 4 in. Grandmaster Gata Kamsky, who made his Olympiad debut for the U.S. at the age of 18, is American chess legend. A five-time U.S. Chess Champion and 2016 U.S. Chess Hall of Fame Inductee, he has represented the U.S. in six Olympiads and three World Team Championships, including 1993 when he was the first board on a team which took first place. He is the only American since World Chess Champion Bobby Fischer to play a match for the World Chess Championship. 5 13⁄16 x 4 in. 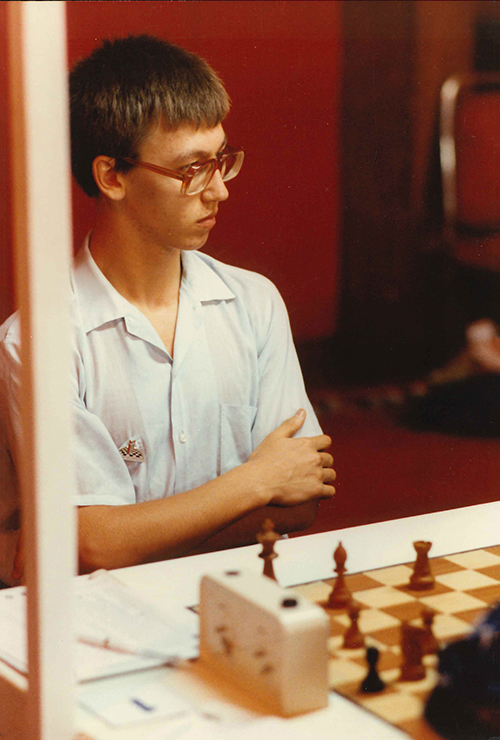 Grandmaster (GM) Boris Gulko, the only player to win both the Soviet and U.S. 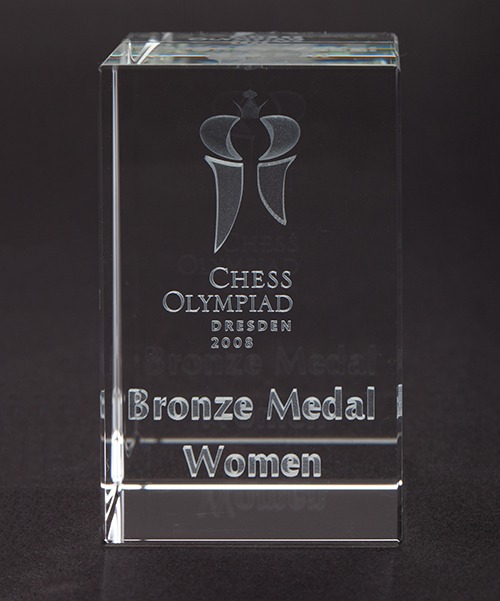 Chess Championships, shares with GMs Yasser Seirawan, Larry Christiansen, and Alex Onischuk the honor of representing the U.S. most times in team competitions (Olympiads and World Team Championships) with 12. 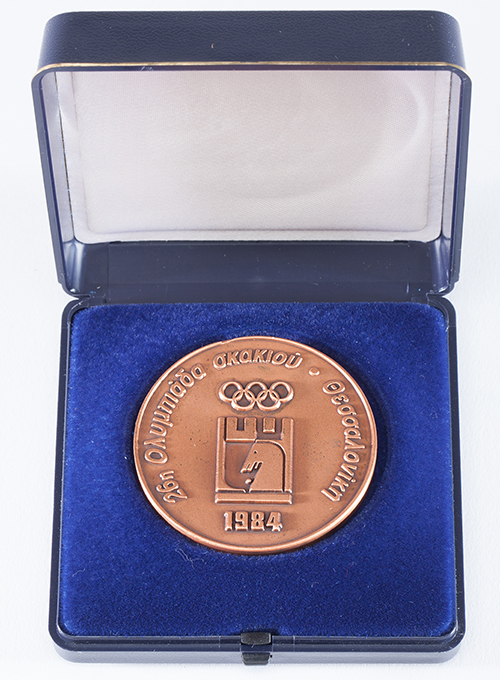 Gulko earned two Olympiad team medals playing for the United States and another for representing the Soviet Union in 1978. The son of a Red Army soldier, Boris Gulko was born in East Germany in the years after World War II. He returned to the Soviet Union as a young child and lived there until the mid-1980s, when he immigrated to the United States. While in the Soviet Union, he won the U.S.S.R. Chess Championship in 1977, a year after attaining GM status. 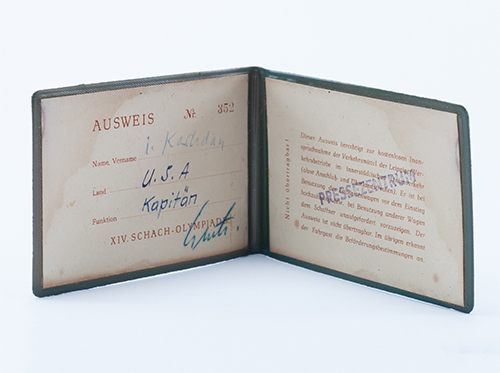 Shortly afterward, Gulko—a staunch anti-communist—and his wife, Anna, were denied permission to leave the country. Gulko himself was once arrested and beaten by KGB agents, and following their failed petition, both he and Anna, who held the title of woman grandmaster, were banned from chess competition until 1986, when they arrived in the United States. While he called his years away from the game “a serious blow” to his career, he found success in his new country, winning the U.S. 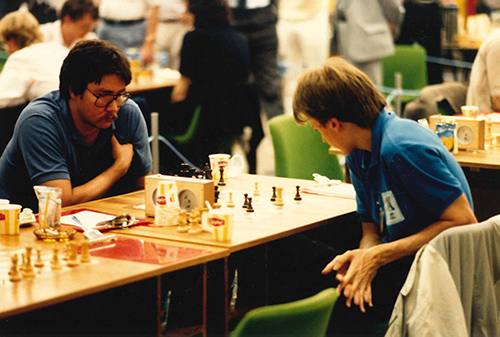 Chess Championship in 1994 and 1999. 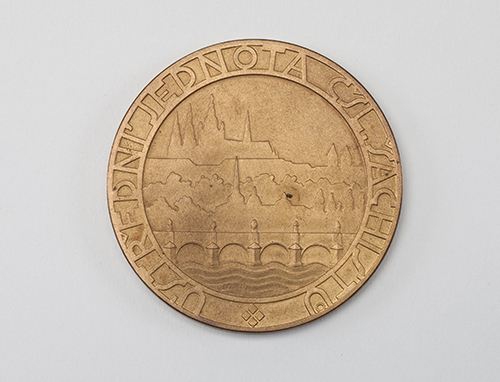 Medal: 2 11⁄16 in. dia. Box: 3 ¾ x 4 x 1 1⁄8 in. Box: 5 x 5 x 1 ½ in. 1 1⁄8 x 3 7⁄16 x 2 7⁄16 in. 3 x 2 x 2 inches. 1 3⁄16 x 11⁄16 in. 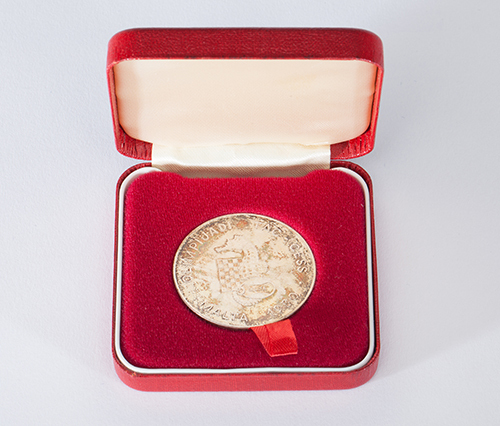 Medal: 2 3⁄8 in. dia. Box: 7 5⁄8 x 6 13⁄16 x 7 5⁄8 in. 4 1/2 x 8 in. dia. 10 3⁄8 x 6 7⁄8 in. 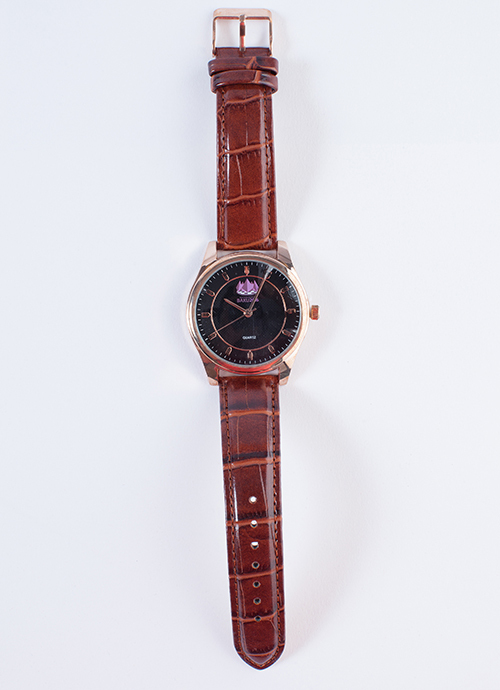 Watch face: 1 ½ in. Box: 3 1⁄16 x 3 3⁄8 x 2 5⁄8 in. 7 ¾ x 3 7⁄8 in.